During the event, Scott presented an update on palaeontological research he has been undertaking using fossils extracted from annual field expeditions at South Walker Creek, made possible through a partnership between the Queensland Museum Network and BMC. Following on from his presentation, Scott had the opportunity to speak with Mr Andrew MacKenzie, Chief Executive Officer of BHP Billiton, a man with over 30 years’ experience in geology and organic chemistry, as you can imagine the pair had a lot to discuss! After wading through topics such as the geology of the Bowen Basin, Pleistocene megafauna and the associated extinction debate, the conversation moved onto dating techniques used to clarify the age of fossils, and the geology of the Fitzroy River Basin before winding up with the community engagement opportunities that have been extended to BMC employees and the local community of Nebo during fossil digs conducted by BMC and Queensland Museum Network. During Scott’s visit, Mr MacKenzie was presented with a replica Diprotodon optatum jaw, produced by the Queensland Museum Network, and which relates specifically to the discovery and preservation work conducted by Scott and his team, of amazing natural and cultural treasures of the Mackay and Isaac region – work that has only been made possible through the on-going partnership with BMC. Jacqui McGill, Asset President, BMC said Scott’s visit provided BMC stakeholders with greater insight to the important discoveries that have been achieved as a result of the partnership. The opportunity for Andrew to meet Scott and hear firsthand about the significance of the discovery was an experience which would be well-remembered. 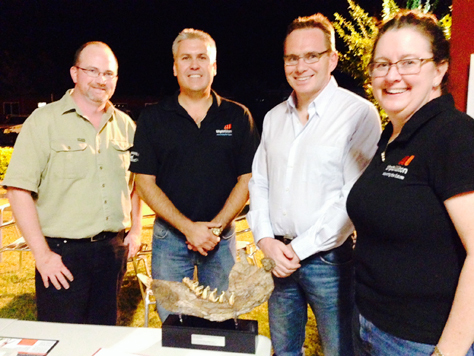 ‘Andrew was delighted to meet Scott and receive the replica Diprotodon Optatum jaw. The cultural treasure reiterates the importance of BMC’s partnership with Queensland Museum and importantly Scott’s findings to our countries history’ she said. Learn more about Scott here and discover more about Queensland’s long-lost inhabitants in the permanent Queensland Museum exhibition Lost Creatures.